Chelsea manager Maurizio Sarri has reportedly given Alvaro Morata permission to discuss a transfer away from Stamford Bridge as Barcelona consider a move. The Spain international has flopped badly in his time in the Premier League and is now widely expected to make the move away from west London this January. As Gazzetta dello Sport link Chelsea with the potential signing of Gonzalo Higuain as Morata’s replacement, the 26-year-old is said to be made available by Sarri, which could alert Barcelona. That’s according to Don Balon, who list the Blues ace as one of four main options the club are considering to bolster their depth up front this January. Morata would likely just be a backup option at the Nou Camp, replacing Paco Alcacer after his departure to Borussia Dortmund this season, but he has previously shone in that kind of role. The best form of Morata’s career came in spells at Juventus and Real Madrid, where he was not always a starter, but excelled in a super-rub role. 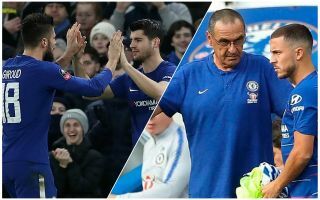 At Chelsea, the expectation from the start was that he would become first choice and replace Diego Costa, who left not long after his arrival, and that weight of expectation has proven too much. It is little surprise Don Balon claim Sarri has given the player the green light to discuss an exit this January.